16 MMS December 2017 mmsonline.com MARK: MY WORD Commentary A Positive Transformation There is a significant difference between tech- nological developments that are transformative and those that are disruptive. 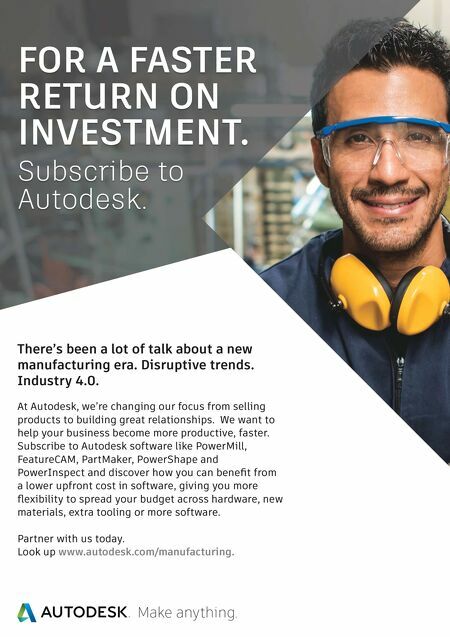 The move to data-driven manufacturing will be primarily transformative. It will change how shops and plants plan, conduct and manage manufacturing processes. However, this change also will be evolutionary, that is, it will follow a direction in which the metalworking indus- try has already been moving. To be clear, I say this move to data-driven manufacturing will be primar- ily transformative, because all changes are disrup- tive to some degree. Customary ways have to yield to new ways. That is the nature of change. In this case, most shops will find that this change involves installing some sort of networked machine- monitoring system for data collection. They will transition to using data collected from networked machines and devices to make better decisions about manufacturing processes. Because this data is generated by computers or processors in the connected devices, then collected and transmitted by a computer network for analysis by software applications, this transformation can appropriately be characterized as a digital one, yet digitalization is a means, not an end. What we are after are the benefits from basing decisions on facts and figures, not guesswork or assumptions. 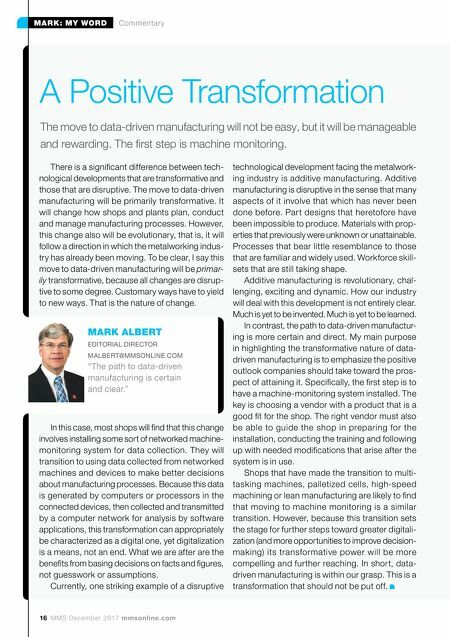 Currently, one striking example of a disruptive MARK ALBERT EDITORIAL DIRECTOR MALBERT@MMSONLINE.COM "The path to data-driven manufacturing is certain and clear." The move to data-driven manufacturing will not be easy, but it will be manageable and rewarding. The first step is machine monitoring. technological development facing the metalwork- ing industry is additive manufacturing. Additive manufacturing is disruptive in the sense that many aspects of it involve that which has never been done before. Part designs that heretofore have been impossible to produce. Materials with prop- erties that previously were unknown or unattainable. Processes that bear little resemblance to those that are familiar and widely used. Workforce skill- sets that are still taking shape. Additive manufacturing is revolutionary, chal- lenging, exciting and dynamic. How our industry will deal with this development is not entirely clear. Much is yet to be invented. Much is yet to be learned. In contrast, the path to data-driven manufactur- ing is more certain and direct. My main purpose in highlighting the transformative nature of data- driven manufacturing is to emphasize the positive outlook companies should take toward the pros- pect of attaining it. Specifically, the first step is to have a machine-monitoring system installed. The key is choosing a vendor with a product that is a good fit for the shop. The right vendor must also be able to guide the shop in preparing for the installation, conducting the training and following up with needed modifications that arise after the system is in use. Shops that have made the transition to multi- tasking machines, palletized cells, high-speed machining or lean manufacturing are likely to find that moving to machine monitoring is a similar transition. However, because this transition sets the stage for further steps toward greater digitali- zation (and more opportunities to improve decision- making) its transformative power will be more compelling and further reaching. In short, data- driven manufacturing is within our grasp. This is a transformation that should not be put off.